Fees & Plans – Easy payment options and interest-free finance to help spread dental costs. At Springfield Dental we provide a comprehensive choice of affordable dental healthcare plans to give you the security of knowing that all your routine preventive dental care is taken care of. Our carefully designed plan from only £12.39 per month ensures that only those people who require additional in-depth treatment pay for it. The benefits of paying by monthly direct debit for our healthcare plan allow you time to help prevent decay and gum disease, an extended payment facility to spread additional costs, substantial discounts on additional treatments, worldwide trauma and emergency call-out insurance, and redundancy protection for up to 12 months. If you have always wanted to enhance your smile but you’re not sure if you can afford it, we offer interest free finance, subject to acceptance, which can be spread over 10 months. 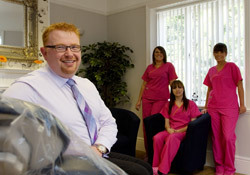 Finance can be arranged in the practice, no deposit is required and treatment can start immediately. Payment is requested at each visit and we accept cash and all major credit and debit cards, and we can take payment by credit or debit card over the telephone. Wow my teeth went so white. I went in over my lunch and the results where brilliant – my best spent lunch hour ever.